Yarrow produces flat-topped inflorescences, and as a result it is sometimesmistaken for one of the umbellifers (Apiaceae). In fact Yarrow is a member of the daisy family, Asteraceae. The plants have feathery leaves arranged around the stems, which can grow up to a metre but are usually less than 0.5m tall, and an inflorescence comprises three to eight roundish ray flowers surrounding between 15 and 40 tiny disc flowers. 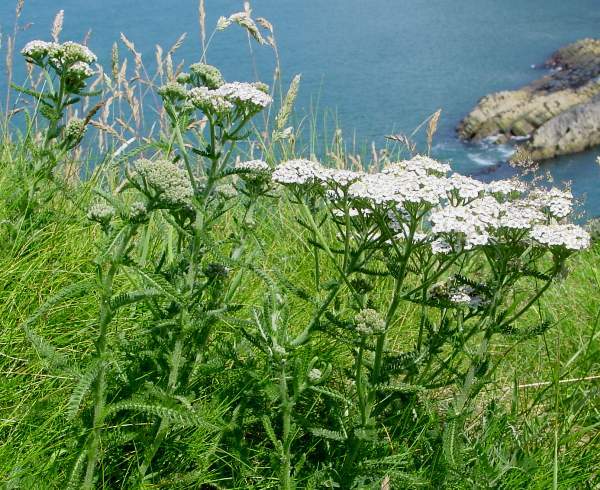 Yarrow is very common throughout Britain and Ireland, and it occurs also across Europe and Asia as well as in North America. This wayside wildflower is found mainly on drier slopes and meadows as well as on many grassy roadside verges. Achillea ptarmica blooms in Britain and Ireland from June until October, and is generally at its best in July and August. Yarrow can reproduce either by means of seeds or by vegetative means. The oblong to lance-shaped fruits of Yarrow are about 2mm long, flattened, and ribbed longitudinally. Each fruit of Yarrow, known as an achene, contains a single seed, but reproduction is also achieved vegetatively by means of underground creeping stems known as rhizomes, from which new plants (which are therefore clones of the parent plant) arise. There are many traditional medical uses recorded for this plant, including its use as an astringent to cure bleeding noses. Herbal tea can be made from the flowers, although given its known medical properties this practice seems rather inadvisable. 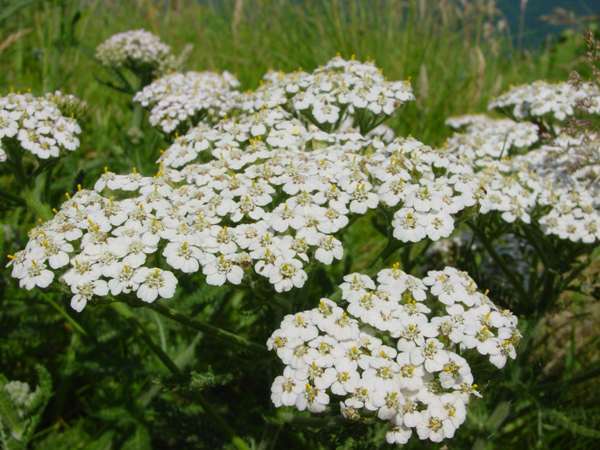 The generic botanical name Achillea stems from the belief that Achilles used Yarrow to treat the wounds of his soldiers. The finely divided leaves give it its specificname (millefoilium means 'with 1000 leaflets'). 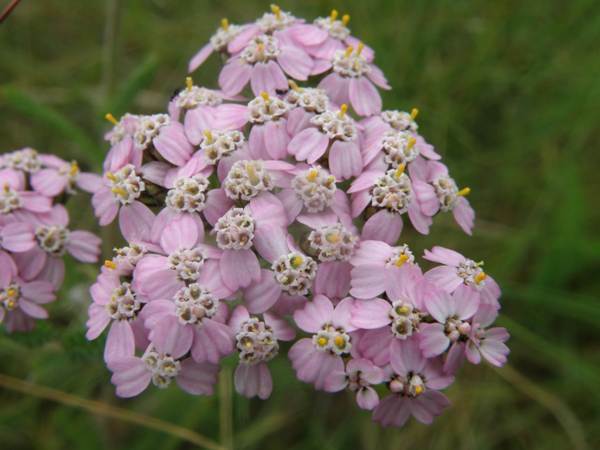 Most Yarrow flowers are white or cream, but some have a mauve flush or occasionally a purple tinge. Other colour forms seen in the wild are almost certainly the result of garden escapes. In Scandinavia a red-flowered form of Yarrow is found occasionally in the wild. 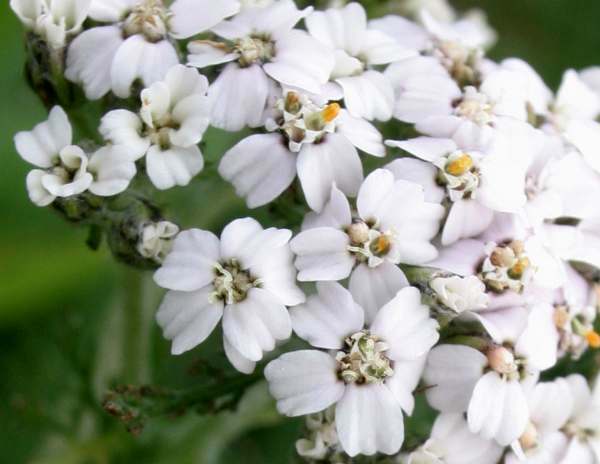 It is not a separate species nor even a subspecies but rather merely a hereditary colour variant; however, selective breeding in cultivation has enabled nurseries to produce Yarrow cultivars raging through white, cream and yellow to mauve, purple, pink and red. Sneezewort, Achillea ptarmica, has larger flowers and fewer of them; it grows in damp grassland sites.